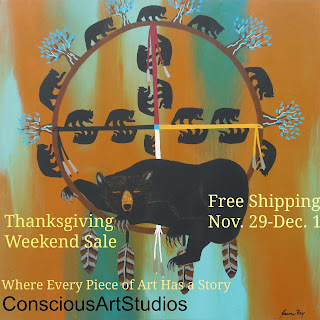 For those of you that find it important to Support Local and Handmade, we are offering Free Shipping for Thanksgiving Weekend and Cyber Monday at Conscious Art Studios. Each of our artworks carry a special symbolic meaning. When I complete a painting, I write a special blog post to tell its story. I will print a copy of that writing and include with with the purchase. This year we have also added a Gift Wrapping Option in the online shop. If you would like your art wrapped for the holidays, scroll through the right sidebar in the online shop for the "Add Gift Wrap" button. The cost for wrapping is $4. If you have multiple purchases that you would like wrapped, it will be $4 per gift - just choose the number of items to wrap by increasing the quantity button. We can ship the art directly to the person you are buying it for. Simply add the recipients shipping information in the "Notes" section at checkout. 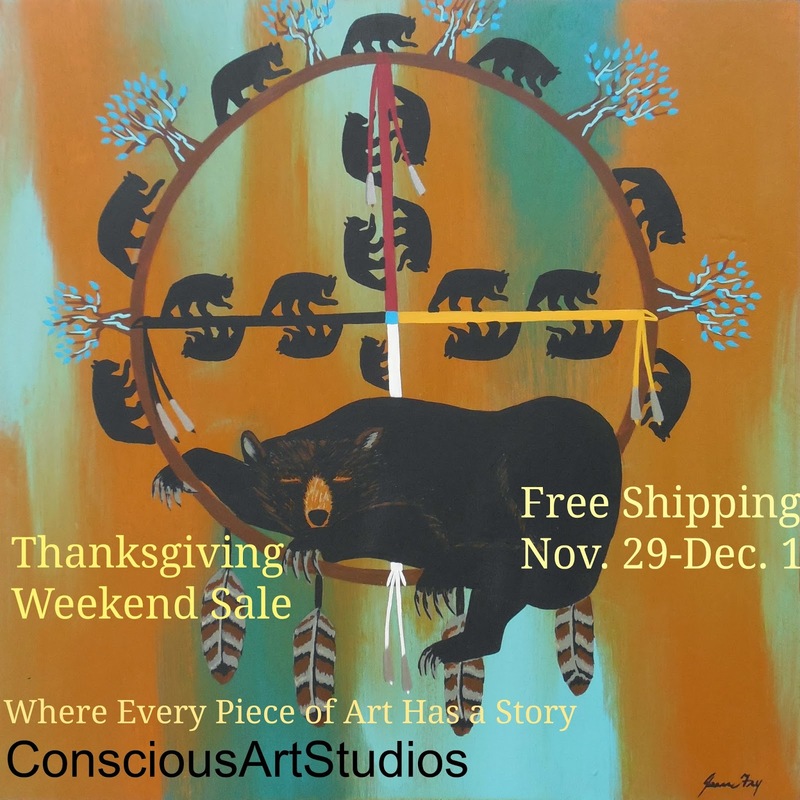 Happy Holiday Shopping and Thank you for supporting our art throughout the year. Giving Animal Totem Art is such a unique and meaningful gift for someone you love. 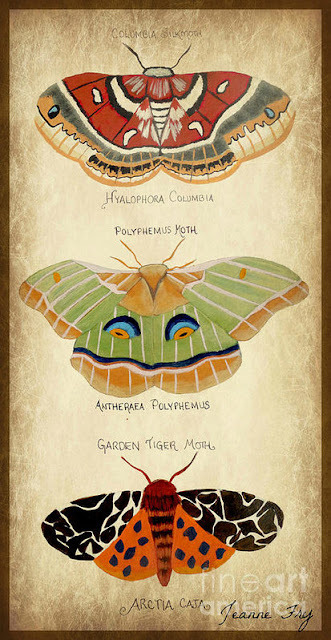 If you don't see a particular totem in the online shop, you can email me and request it. I will do my best to create it in time to ship before Christmas. When I raised my children there were many ideals that I thought were important to pass on to them. One of the most important ones, was to see beyond our differences. As I myself was born with a birth defect that left me with a physical handicap growing up, I knew first hand the types of discrimination, misconceptions, bullying and ridicule that exist in the world. My wish was that my children would grow up to see beyond color, disability, race, sexual orientation, and social class. I had many things I wanted to teach my children. Some were successful and some were not...but this very important ideal was learned quickly. I was always proud of them, noticing that when they were put in a situation where people's differences came into play....they saw the human...the things that make us the same, and the differences were overlooked. I've been saddened the past few years (since our hard fall in the economy), that we humans are becoming more and more divided. Bullying, hate crimes, road rage, and an intolerance for others and their beliefs seems to be on a continual rise. I associate some of this with the economy decline, as I feel that so many have been living their lives in a day to day state of fear....and fear leads to these negative behaviors. I also feel that we are losing the art of communication. While it may mistakenly seem as if we are more connected because of technology, our young ones are losing the practice of effective and compassionate conversation. These two things combined isolate us in a sense, within ourselves...making it easier to fall into the trap of feeling as if no one understands us. Then, our differences become more prevalent. I painted "We All See the Same Moon", as a reminder of our similarities. I tried to bring my thoughts to the canvas within a celestial scene. Four moon gazers are standing together looking upon the moon. Each of the figures are different, yet the same. They all have their own distinct styles, yet fit together in common bond. They are able to look beyond their differences and unite as one under the moon in peace. My most recent painting is titled "Emotional Healing", and focuses on the Sea Turtle Totem and incorporation of Reiki Symbols. I was inspired to create a painting that would be soothing and be symbolic for the healing of our thoughts...feelings...and emotions. The Sea Turtle and the Water itself, both are symbolic of the Feminine, Motherhood, and the Nurturing that is involved with our personal growth and evolving as we age. They represent the ability to find balance in one's emotions, thereby being able to make solid choices that make both the heart and mind content. That balance also helps us to "ride the current", or ups and downs in life's journey. As a Traditional Usui Reiki Master/Teacher, I decided to incorporate a few of the Reiki Healing Symbols into the painting, to amplify the healing effects. The Cho Ku Rei symbol is a power symbol, and was painted to boost the balancing aspects. The Sei He Ki is a specific symbol that is used for emotional and relationship healing. 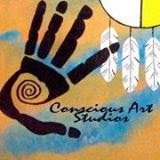 And I used a Contemporary Master Symbol, for Soul Healing and to represent the Light of the Awakened Heart. This is a powerful healing piece of artwork, that I envisioned could be used as a meditation tool, or to display in a massage therapist's or healer's office. The soothing calming color work and the symbolism is engaging and brings one to focus. The Original Painting has sold. Art Prints of it are available in my Fine Art America online shop. They will ship directly to you. AnnaMae loves people, and more than that she loves giving out hugs, kisses, and inspiring others. But as AnnaMae gets older, she is taking care of others more and more, and take care of herself less and less. She is getting tired and burned out. A tired fairy is not a good thing. Mr. Toad, one of AnnaMae's close friends, has decided to step in and help. He watches over her and prompts her to keep herself high on her Fairy List of Deeds. Mr. Toad : "It's 3:00pm AnnaMae. It's time for a little nap." Mr Toad: "AnnaMae, you know that if you are going to continue spreading your smiles and magic in the Realm, you need to take a little rest and recharge your spirit. How can you inspire others, if you don't take care of yourself?" AnnaMae: "You're right Mr. Toad. You're right, of course. Let's just close our eyes and rest here under the Toadstool for a bit, and float in happy dreams and fairy dust." AnnaMae is grateful to Mr. Toad. They stick together like peas in a pod. She carries him in her pocket throughout the day, for they both know that they each need to the other. This is an original painting, and is #2 in my series "Face of the Fae". It is a 5x7 painting, matted in an 8x10 matte.